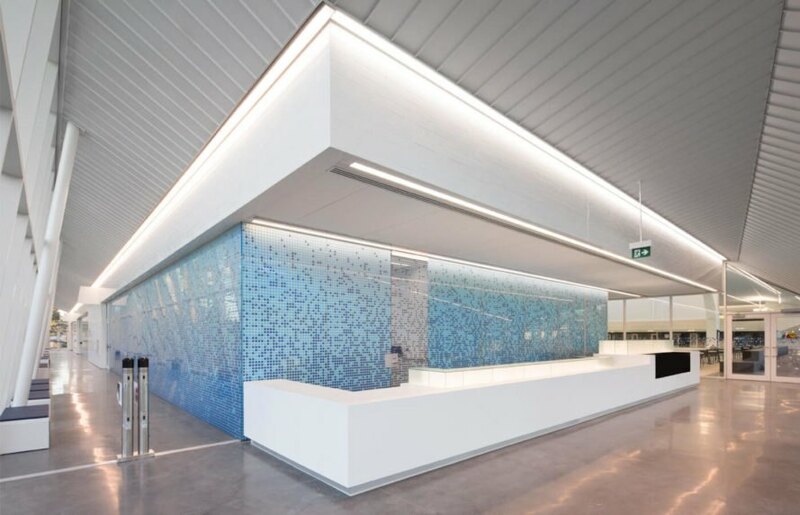 A striking aquatics center at the University of British Columbia Vancouver melds elite-level swimming facilities with impressive eco-credentials. 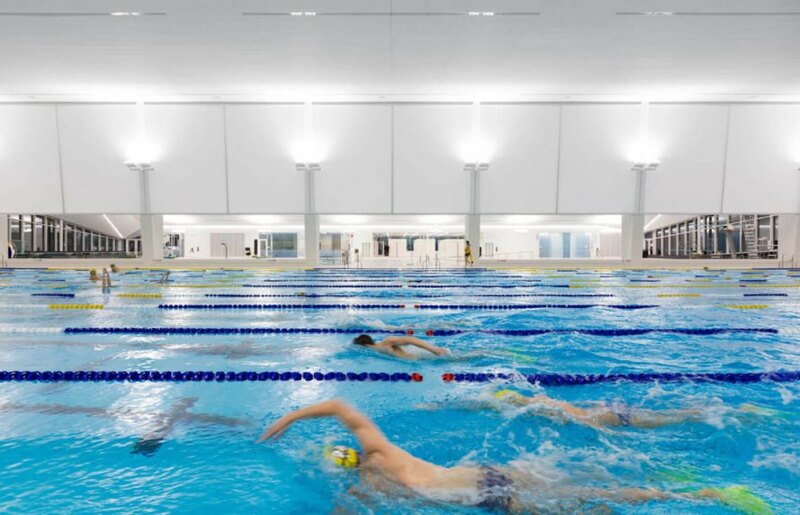 Canadian architecture firm MJMA worked with Acton Ostry Architects to design the UBC Aquatic Center to LEED Gold specifications. The center is awash in high water demands with its three pools, hot tub, steam and sauna, drinking fountains, and 34 showers. To meet water efficiency regulations set out by UBC and LEED, the architects employed an innovative water management system that includes water recycling and an underground cistern tank that can store 1.3 million liters of rainwater at a time. 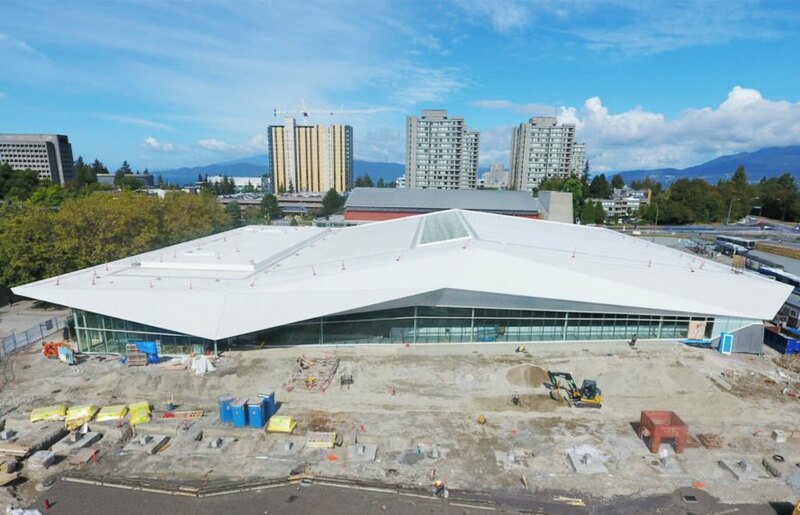 The 85,000-square-foot UBC Aquatic Center is more than just a recreational facility for UBC staff and students. Envisioned as a community resource, the swimming center was also created to provide a high-performance training and competition venue for Olympians and includes separated sections for Community Aquatics and Competition Aquatics. In a fitting response to the demanding brief, the architects topped the mostly glazed building with a white angular roof for that gives the facility a sense of eye-catching drama and helps facilitate rainwater collection. Combined with a long skylight that bisects the building, the continuous ceramic fritted glazing that wraps around three elevations brings in copious amounts of natural light. Sensors for zoned lighting control help reduce electricity demands. Healthy indoor air quality is promoted with an air flow system that replaces chloromine-contaminated air from the top of the water surface with fresh air. Water is captured from the roof and reused for plumbing, landscape irrigation and pool top up. Rainwater collection provides the facility with around 2.7 million liters of water each year—an amount equivalent to an Olympic-sized pool. Renewable materials were also used throughout the build with approximately 30% of materials sourced from British Columbia and Washington State. 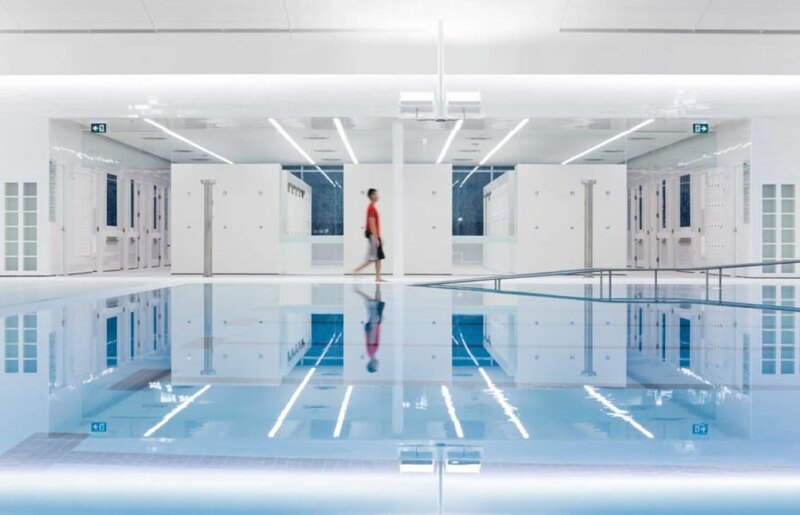 A striking aquatics center on the University of British Columbia Vancouver Campus melds elite-level swimming facilities with impressive eco-credentials. 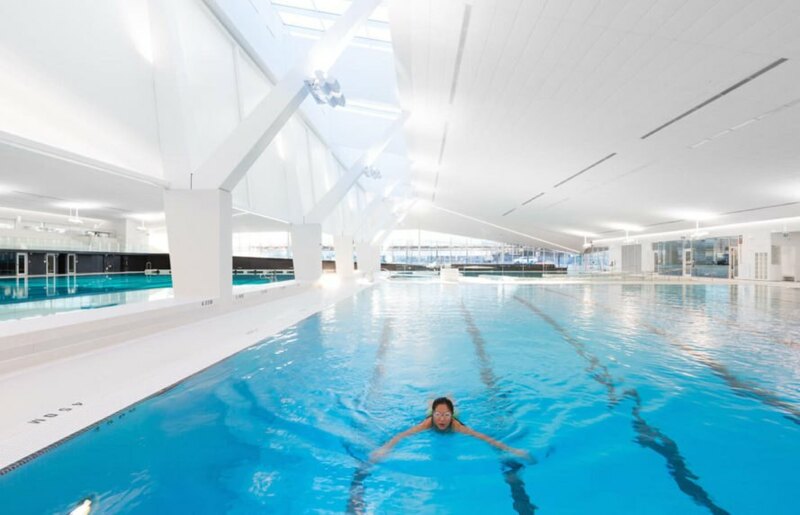 Designed by Canadian architecture firm MJMA, in collaboration with Acton Ostry Architects, to achieve LEED Gold certification, the UBC Aquatic Center is awash in high water demands with its three pools, hot tub, steam and sauna, drinking fountains, and 34 showers. To meet water efficiency regulations set out by UBC and LEED Gold, the architects employed an innovative water management system that includes water recycling and an underground cistern tank that can store 1.3 million liters of rainwater at a time. The 85,000-square-foot UBC Aquatic Center is more than just a recreational facility for UBC staff and students. Envisioned as a community resource, the swimming center was also created to provide a high-performance training and competition venue for Olympians and includes separated sections for Community Aquatics and Competition Aquatics. In a fitting response to the demanding brief, the architects topped the mostly glazed building with a white angular roof for that gives the facility a sense of eye-catching drama and helps facilitate rainwater collection. Combined with a long skylight that bisects the building, the continuous ceramic fritted glazing that wraps around three elevations brings in copious amounts of natural light. Sensors for zoned lighting control help reduce electricity demands. Healthy indoor air quality is promoted with an air flow system that replaces chloromine-contaminated air from the top of the water surface with fresh air. Water is captured from the roof and reused for plumbing, landscape irrigation and pool top up. Rainwater collection provides the facility with around 2.7 million liters of water each year—an amount equivalent to an Olympic-sized pool. Renewable materials were also used throughout the build with approximately 30% of materials sourced from British Columbia and Washington State.